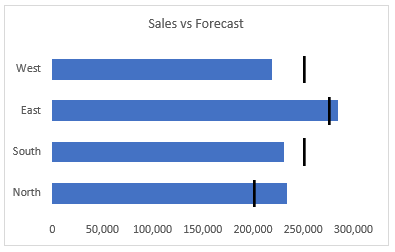 Using target markers in a bar chart to compare a value (such as actual sales) to a target (such as budget or forecast) provides a clean display. As with anything in Excel, there are several ways to build such a chart. In this post, we’ll walk through a technique that does not require any calculated helper columns (the shadow technique). And, once you have created the chart and want to distribute it, a file sharing service like Dropbox can help. Let’s say we want to compare an actual value with a target value. There are many examples of this, including actual to budget, headcount to plan, sales to forecast, and so on. Rather than provide a bar for each, we can provide a horizontal bar for the actual value and a vertical marker for the target value, as shown below. I’ve provided a short video and written a narrative below with the detailed steps. This post is brought to you by Dropbox. Before we jump to the detailed steps, I’d like to thank our sponsor Dropbox. I’ve personally been a Dropbox user for over seven years. They provide many capabilities, including the ability to send large files … like large Excel workbooks! The next time you need to share your beautiful chart or Excel workbook, rather than emailing a large attachment, check out this service from Dropbox. It provides an easy way to send secure files and password protect them … without attaching huge files to an email. These are the exact values we’ll use in our chart, and, there are no additional calculations or helper columns needed. The first step is to insert the chart. Now, we need to update the overlap. 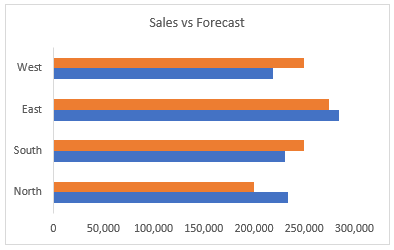 To change the Series Overlap, select either the sales or forecast bars and click Chart Tools > Format Selection. This opens the format panel, and you can use the Series Overlap slider or type in the desired value of 100% as shown below. Now, we just need to make a few formatting updates to the target series. 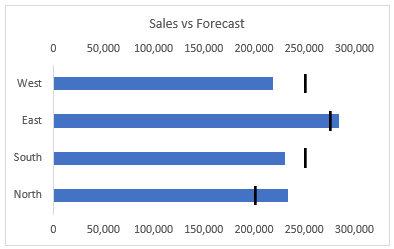 To format the target series, we select the target bars (in this case Forecast) and use the format panel. Under the Fill & Line category, we select No fill as shown below. We set transparency to 0%, Size to 100%, Blur to 0 pt, Angle to 0, and Distance to 2 pt as shown below. Next, under the Series Options category, we opt to plot the series on the Secondary axis, and adjust the Gap Width as desired. The updated chart is shown below. At this point, we need to be absolutely sure that the primary and secondary axis scales are the same if we are going to display them both. Otherwise, the target markers won’t be in the right spot. If the primary and secondary axis scales are different, you’ll want to manually set them both by using Axis Options to set the Minimum bound to zero and the Maximum bound to be the same for both. And, our updated chart is shown below. Yay … we did it! Note: We can update the gap width for both the sales and forecast values to control the bar and marker heights independently as desired. 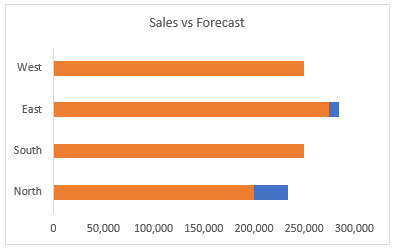 If you are using vertical bars instead of horizontal, then, you’ll want to use an Excel Clustered Column chart instead of a bar chart. You can use the same steps as above, except, use a shadow angle of 270 instead of 0. This chart is shown below. The sample file below contains examples and steps for all three variations. 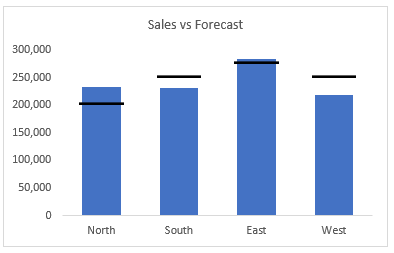 In addition to plotting the sales and forecast values, there are other options for featuring this type of relationship, including plotting the variance directly. For more information about graph design, check out one of my favorite data visualization websites … or grab a copy of one of my favorite data visualization books Show Me the Numbers. 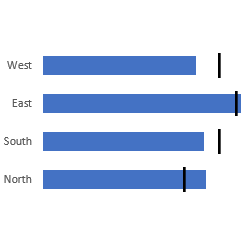 If you prefer other ways to create the vertical target markers in a horizontal bar chart besides the shadow technique, please share by posting a comment below … thanks! This is a sponsored post for Dropbox. All opinions are my own. Dropbox is not affiliated with nor endorses any other products or services mentioned. 100% of sponsor proceeds fund the Excel University scholarship and financial aid programs … thank you! If you’d like information on becoming a sponsor, please check out our sponsorship opportunities page.